Dr. Paul Syltie (PHD in agriculture and soil fertility) and I visited Brazil in the tribal area of Maloca of Moscou from April 7th till April 15th 2014. 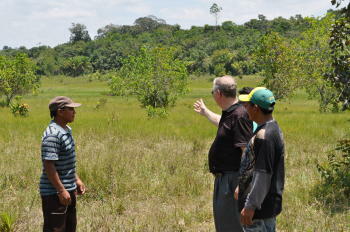 The purpose of that visit was to investigate soil conditions and the agricultural approaches by the indigenous people. This initial investigatory visit was planned to determine how we could advise the local brethren and their surrounding community on how to improve their nutrition and overall living conditions. Our intent is to advise them in what to do to have a better soil, to diversify their plantations and crops, and thereby improve their agricultural methodologies, as far it is reasonable within their capabilities and according to their prevailing tropical environment. As the old adage goes, the intent is to ‘help them fish better and not to catch fish for them’. That way they can then be an example and help the surrounding community. An integral part of this investigation, was to visit the area where the LifeNets donated livestock is, and to identify if improvements in the livestock care were need. The herd consists at this moment of 12 heads which are being tended by the brethren. 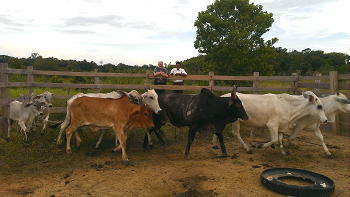 The herd is growing due to local breeding, as we only bought a total of 9 heads at two different times. 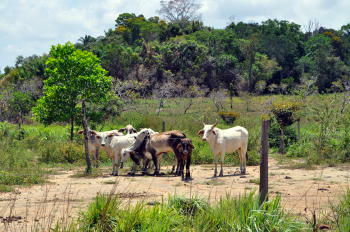 The cattle is situated in a lush area, with a near-by river, and when we were there it was a time of intense drought in Brazil. Even under these harsh drought conditions there were many puddles of water in the river bed for the cattle to drink from. The area has virtually unlimited space to expand. As a result of Dr Syltie’s investigation, a different type of trace-mineralized salt was identified in the local growers shop and we purchased for them sufficient salt for the next few months and left with them sufficient funds to purchase salt for a whole year. The introduction of this supplement to replace the existing salt they were using, will result in better nutrition for the cattle, because the local vegetation is deficient in several vital nutrients. These trace minerals will compensate for that. In summary the cattle is being well taken care of and we are well pleased to note that the count of 12 heads is already. Thank you for LifeNets ongoing support. 33% Growth, Healthy and More on the Way! 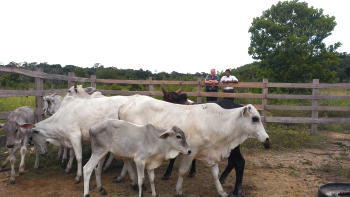 Jorge de Campos completed a successful visit to the Northern region of Brazil where he took the time to observe the condition of LifeNets cattle which was donated to members of United Church of God, Brazil, in the Amerindian village of Maloca de Moscou, 40 miles north east of Boa Vista. 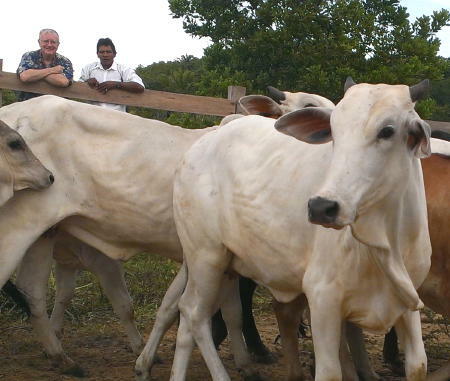 Adriano da Silva, a United member in Maloca de Moscou, looks after the cattle, by letting them out into the pasture every morning and gathering them every day. He also ensures that they have the right dosage of salts and medication as necessary. 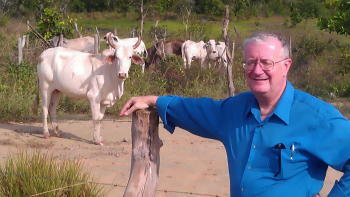 There was great joy in showing me the cattle and the area where they pasture. It is a well grassed area with many acres as far as the eye can see. It has a type of grass which was planted specifically for cattle breeding, free running water from a local stream which runs through the property, a small water reservoir and a large number of trees with plenty of shade. 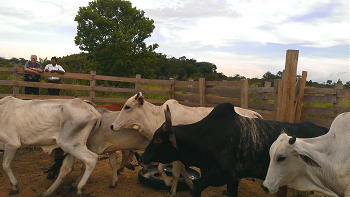 They are using the cattle to breed and to pass the gift in the future to the members in the local community. 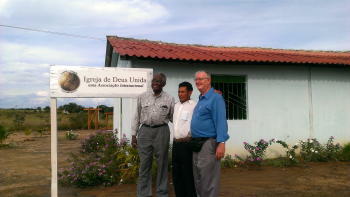 Jorge de Campos is the senior pastor responsible for Brazil and visits this community about three times a year. 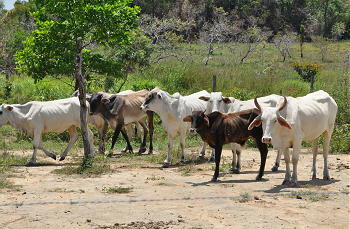 LifeNets is starting a new cattle project in Brazil to assist people in the indigenous tribal area of Maloca de Moscow. 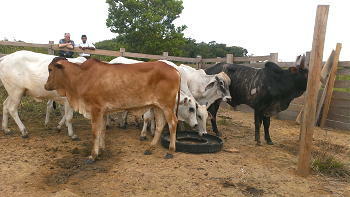 We have already purchased 6 heifers and placed them in a well watered and grassy area in the tribal territory. The area has grass which was planted many years ago by previous farmers in the land before the area was allocated as region and it has a water reservoir and a river with clean water which has flowed continously even during the driest periods. The people have fenced the area with barbed wire and are planning to build a special enclosed area for breeding. 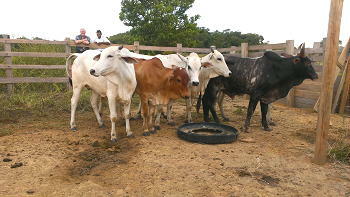 The plan is to help them to build up to 20 heads of cattle. 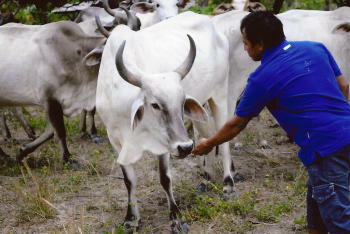 This mean that we are planning to help them purchase another 14 heifers at an average cost of approximately $400 per heifer, and a young bullock at an approximate cost of $600, making a total estimated cost of $6200 for the heads of cattle alone, beside other construction costs, vaccinations, etc. The poplulation of Maloca is mainly farmers and they are planting various types of seed, such as Mandioc, Sugar cane, and Wheat. Another major need that they have is one of a second-hand tractor to help them in the planting of seed and of a scooter to help them to move around in this large area. We hope to help them purchase these two items one once we have fulfilled the initial need for the cattle project. 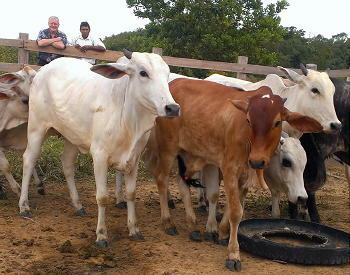 We thank you all for the help in supporting this LifeNets project of cattle and subsequent tractor and scooter. I met Jorge DeCampos in Brazil with the purpose of being shown the work that was taking place on behalf of the Wapashana people of Northern Brazil. After a very long trip into the Amazon including 3 hours by car over axle breaking roads, we met with the Wapishana. 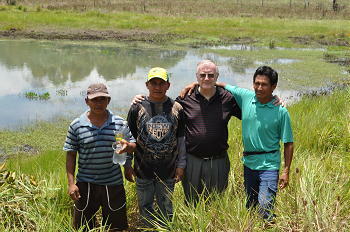 Though I was there to help Jorge, most of my experience was learning, both from Jorge, and from the Wapashana people. What follows is a record of what I saw, first concerning the cattle that have been provided for the well being of the people and the secondly the people themselves. 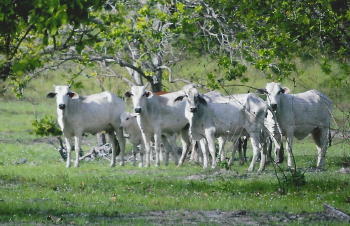 The cattle are pastured on a large section savanna bordered by what the people call bush, what I call Jungle. It is dense, has a canopy in places heavy enough to darken it, and it shelters animals. The cattle have a large tank, (pond dug buy machine and then is filled with water either due to seepage, or rain), one that easily suits their needs, and could water many more head of cattle. Additionally there is a stream that runs through the pasture, that is free flowing, fresh water that is easily accessible. At the time that I saw it ranged from 5 to 10 feet wide and equally as deep. I tested the depth by getting into it. The water was clear and cool, as to its usefulness for drinking I do not know. I did not test it in any way, nor did I drink it, but it seemed to me that the cattle drank it with impunity. The people did not make any statement to the contrary. 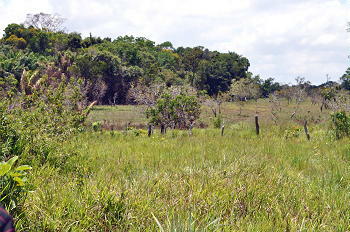 The land is by my estimate, more than large enough for the cattle’s grazing needs, and people told me that the savanna grass has been replaced by grass that will fatten the cattle. 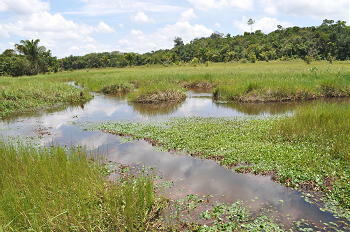 The location, the watering tank and the grass were all done by the people whom previously held the land. The Wapashana people have fenced in the acreage which in my estimation-and once again of which I am not an expert on-was more than 100 acres, and the cattle are secure. 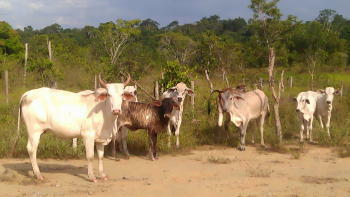 The area is, according to the people, free of predators, the cattle seemed in good health, that is they seemed free of illness. I am not a vet, but casual observation revealed no major problems. I am used to fat Texas cattle so they seemed thin to me, but with the abundance of grass, that could easily end. As for the peoples understanding of the care of the cattle, again, casual observation from a non expert, but they seemed to know, understand, and be responsive to the animals in ways that I have observed people caring for cattle in Texas. It was gratifying to see this, as the people clearly needed the cattle and valued them. These people are industrious and willing to learn. 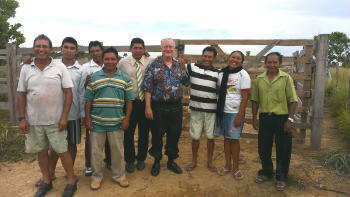 They have electricity for the first time in their history in Northern Brazil. I was told this is how it occurred. One young man decided they needed electricity, so he traveled to Boa Vista presented his case to the city counsel for a week, and then the National Government sent out workers to bring electricity to the people. I went to this mans home, and while his roof was palm fronds, and his floor clay, he had a refrigerator to preserve food. 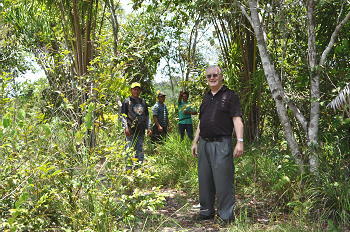 I was shown the area where the manioc root was processed, and the fields of manioc growing, they stretched for acres. This root is the staple of their diet so any help we can give, I.E. the cattle is a huge help. These people are ready to grow and learn, and yet they will and must keep aspects of their traditional culture which are so key to their existence. I already touched on one aspect, hard work, and industriousness. Another is their respect and honor to their elders, and of course, their agricultural base as a way of living. The people and the land are a natural union, even with modernization and education this should not pass. The Wapashana people accepted me as a guest without reservation, based I assume on the relationship that George DeCampos has built with them. They were kind and generous to us both, and to the very best of their abilities looked after our well being. For example, we brought with us a large container of water that we had purchased for our use. When we finished that they did not serve us their well water, instead they collected and opened cocoanuts and poured us drinks from that source. This was my first meeting. The days we spent there were memorable in the way that sticks with one for good. The people are kind, friendly, genuine and very quick in manner and action. In my days there I felt sometimes as if I were the one being studied, and educated. These people were eager to listen, and patient to show us who they were. We ate outside at a large table and the food was good, and more sophisticatedly prepared than I expected. I was continually fascinated by the mixture of ancient and modern cultures interacting in the people to produce a lifestyle that was at once both very traditional and adaptive. For instance, Trumpets was held in a open grass hut with a dirt floor but we had hymns on cd. I felt genuine warmth from these people, which was gratifying not merely because it reassured me that I was doing the right thing by visiting them, but also because outsiders have traditionally remained so in Wapishana culture. The men were quiet and soft spoken but engaging. They enjoyed talking to us, and both the men and the women were willing to question me through Mr. de Campos, and then listen thoughtfully to my responses. They were eager to show me the things I was curious about. The production process for manioc root, climbing like a monkey the perfectly smooth and very tall trees to retrieve the fruit, and most of all swimming in the rivers, which they laughingly (they were amused by our concern), told us that yes the water had piranhas and snakes. I will remember that swim for a very long time both for the fear of it, and for the very cool, almost cold refreshness of it. The thing I was most impressed with though, and the reason Mr. de Campos and I were there, was their mature understanding of the word of God, which stood in stark contrast to their most remote, and primitive surroundings.I have brothers and sisters in a place I could never have imagined.